For 25 years the Christmas shop in Lechlade has been delighting both adults and children in its beautiful ‘Aladdin’s Cave‘ of Christmas gifts and decorations. 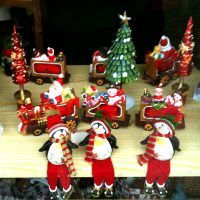 With decorations made in different parts of Europe, but mostly traditionally German, there are so many wonderful things to explore that the shop evokes the spirit of Christmas all year long. Attracting visitors from all over the world this amazing shop located within the sleepy Cotswold town of Lechlade on the upper Thames is the perfect place to while away your time and stock up on some unique and very special gifts. Running a shop all year round that specialises in Christmas might seem a rather daring business venture but this shop shows that by opening your mind to all possibilities almost anything can be achieved!